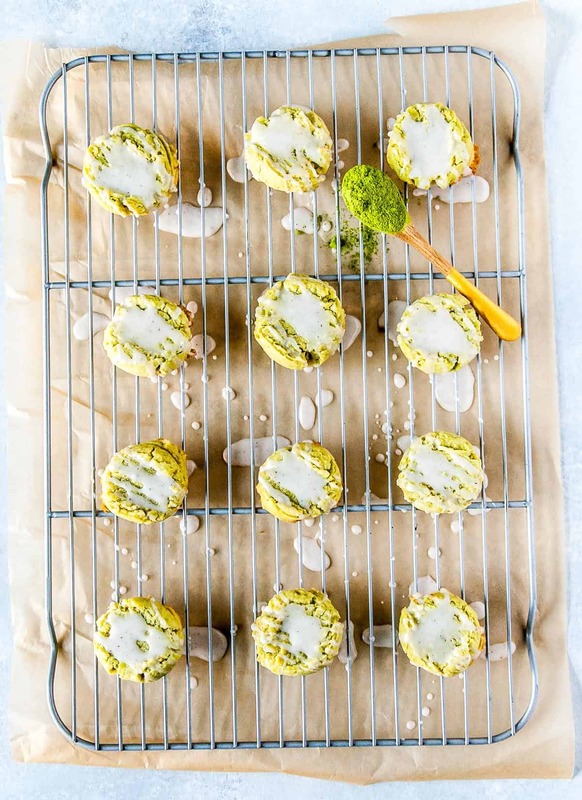 Vegan matcha shortbread cookies, with a perfect vanilla bean glaze! These are a perfectly sweet dessert or for dipping into a hot cup of coffee. Matcha is still having a moment, right? I know I’ve put it in just about everything so far, from a smoothie to scones, and even in an ice cream float..but I can’t stop! There’s something about that green tea flavor that pairs so well in desserts. So, when I finally nailed my vegan shortbread cookie recipe, I knew matcha was going to be the perfect pairing. 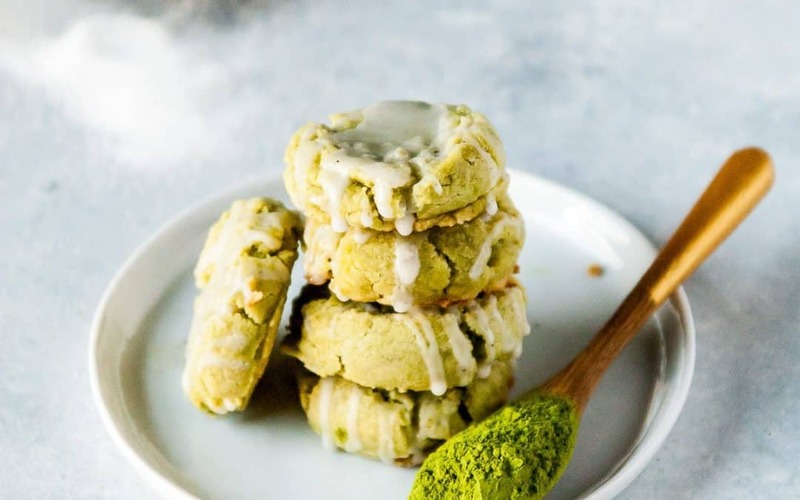 Top the vegan matcha shortbread cookies with a vanilla bean glaze, and you have a perfect cookie for dessert, dunking, and everything in between. I will say that nailing this matcha cookie recipe was a bit of a struggle. Adding matcha into a base vegan shortbread cookie recipe wasn’t as easy as I had hoped, throwing off the texture and color of the cookie dough more than I imagined. For some reason, I forgot that adding almond milk and olive oil to the batter was going to make the matcha darker, so I added WAY too much to my first batch and ended up with a batch of dark green cookies that looked like they were made of spinach. PASS. Next, my dough was too dry, so I had to add a little more oil and almond milk and press the cookies down when they were fresh out of the oven. 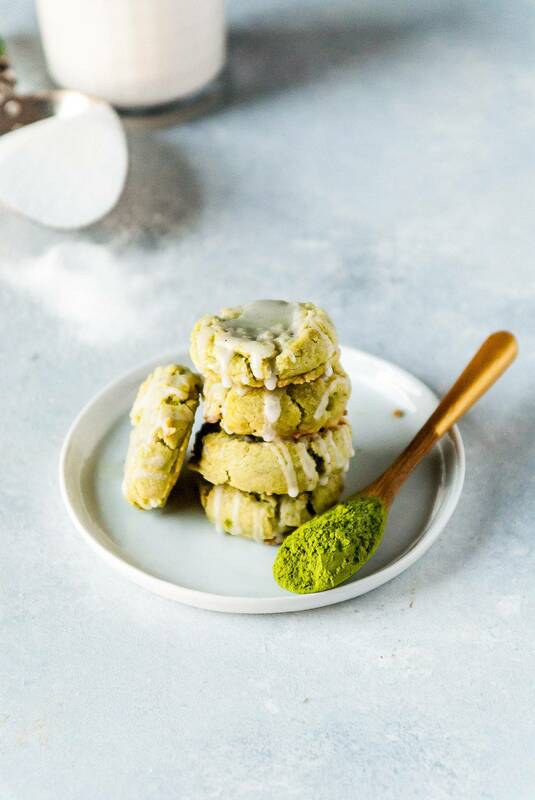 The get that vegan shortbread texture you really want with these matcha cookies, you have to press them down slightly with a fork right when they come out of the oven. It creates a perfect buttery texture in the middle and crispy edges on the cookies. Perfection! What’s the best matcha to use? 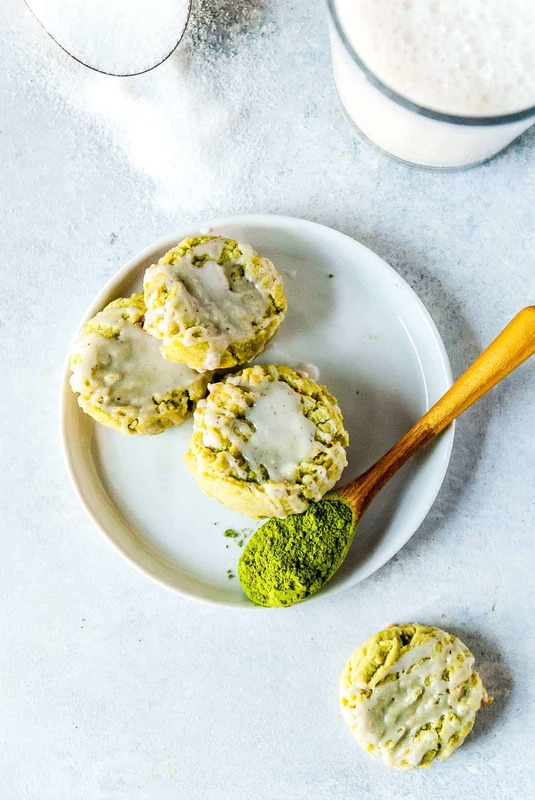 If you aren’t sure what kind of matcha to use in this vegan matcha shortbread recipe, go with my rule of thumb of buying the second nicest matcha. Matcha isn’t something you necessarily want to skimp on (it will taste really grassy and weird), but I know not everyone wants to spend all their dollar bills on a bag of green tea powder. I usually try to find one that isn’t the bottom of the barrel, cheapest one out there, but also isn’t a million dollar a bag. Somewhere in between should be fine, and will give you a solid matcha taste without breaking the bank! Use unsweetened almond milk—Even if you buy plain almond milk, it’s easy to accidentally pick the sweetened stuff. 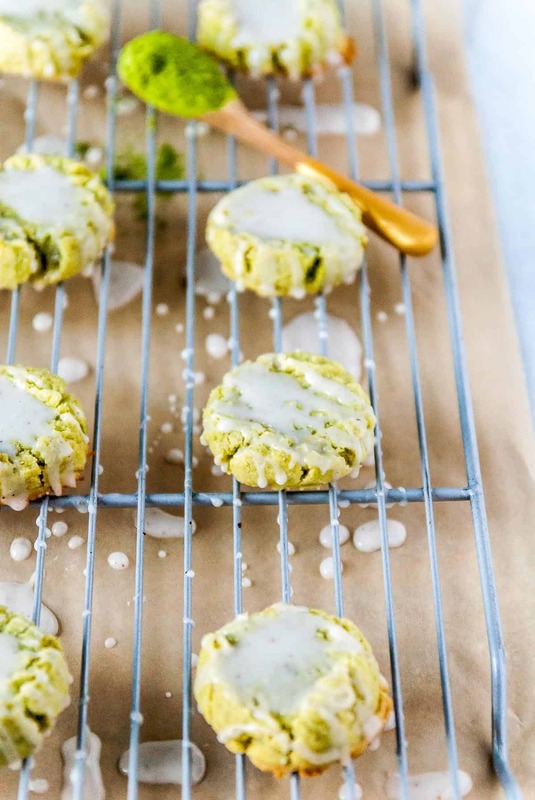 To make sure your matcha shortbread isn’t too sweet, opt for the unsweetened almond milk. Don’t use a sugar substitute—Powdered sugar is a must in this vegan shortbread recipe. Regular sugar would be too heavy in this recipe, and brown sugar is a hard pass. 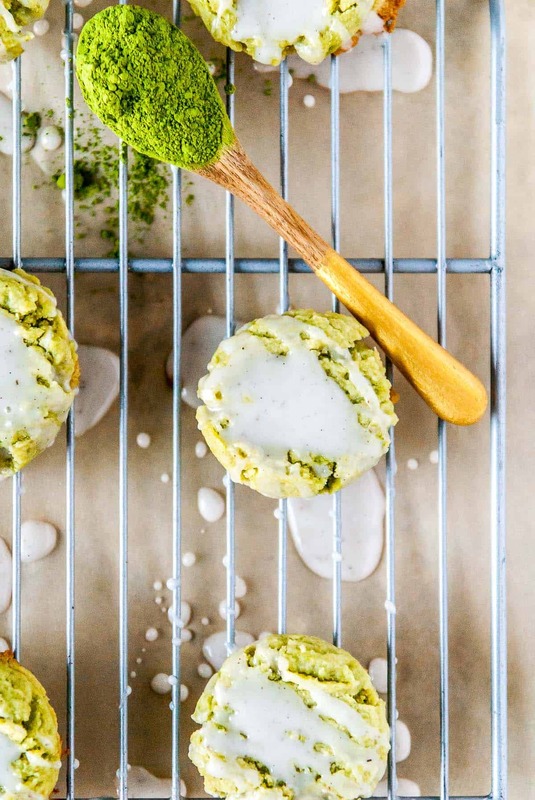 Don’t over bake the cookies—Take the matcha cookies out of the oven as soon as they start turning brown around the edges. If you bake them for too long, the cookies will be too crumbly and will fall apart as soon as you bite into them. Preheat oven to 400ºF. Line two rimmed baking sheets with parchment paper and set aside. In a medium bowl, whisk together the flour, salt, and powdered sugar. Set aside. In a large bowl, whisk together the olive oil, almond milk, and vanilla. Add the flour mixture and fold in with a spatula until well incorporated and no flour streaks remain. Scoop the cookie dough out onto the prepared baking sheets by the tablespoon, spacing about 1-2 inches apart. Bake for 10-12 minutes, until cookies are just set and beginning to brown on the edges. Don’t overbake them, or they will become crumbly! As soon as the cookies are out of the oven, press down on each slightly with a fork to make them more disc shaped. While the cookies are cooling, prepare the glaze by whisking together the powdered sugar, vanilla bean, and almond milk until smooth. When cookies have cooled, drizzle the glaze over each and serve. These photos are looking great, gf!!!! I’m assuming you incorporate the matcha with the other dry ingredients? The recipe doesn’t say when to add it.